This course offers students a unique opportunity to learn from two tax professionals as they share their expertise in a myriad of IRS practice and procedure subjects. Both Stuart Sobel and Steven Mopsick retired from high-level positions with the Internal Revenue Service. Since their retirement, they have practiced extensively in the private sector. 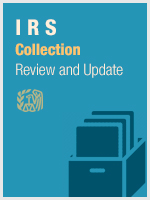 Define the IRS terminology relating to levies, liens, seizures, collection, etc.